The nation's economic woes appear to be taking a toll on McCain. WASHINGTON (CNN) - A new CNN/Opinion Research Corporation Poll suggests that by a 2-to-1 margin, Americans blame Republicans over Democrats for the financial crisis that has swept across the country the past few weeks — one factor that may have contributed to an apparent increase in Barack Obama’s edge over John McCain in the race for the White House. The poll also indicates that more Americans think Obama, the Democratic presidential nominee, would do a better job handling an economic crisis than McCain, the Republican presidential nominee. Forty-nine percent of those questioned say Obama would display good judgment in an economic crisis, 6 points higher than the number who said the same about McCain. And Obama has a 10 point lead over McCain on the question of who would better handle the economy overall. These numbers appear to be affecting the battle for the presidency. Fifty-one percent of registered voters are backing Obama, who now holds a 5 point edge over McCain, at 46 percent. McCain and Obama were tied at 48 percent apiece in the previous CNN/Opinion Research Corporation survey. Obama's advantage, while growing, is still within the poll's sampling error of plus or minus 3 percentage points. "The economy has always been considered John McCain's Achilles’ heel, and the CNN poll of polls started to show an Obama edge in the middle of last week - just as the financial crisis began to hit home for many Americans," said CNN Polling Director Keating Holland. The poll also expands to include third party candidates. When included in the results, Obama has the backing of 48 percent of likely voters, three points ahead of McCain at 45 percent. Independent Ralph Nader has the support of 4 percent of those polled, with Libertarian candidate Bob Barr and Green Party candidate Cynthia McKinney each at one percent. A couple of other factors in the survey appear to be contributing to Obama's slight rise and McCain's slight drop in the polls. Fifty-three percent of those questioned say McCain, if elected, will mostly carry out the policies of President George W. Bush, who remains extremely unpopular with most Americans. That's up 3 points from our previous poll. The survey also indicates Obama's recaptured the advantage on "change": Just after the Republican convention, Obama's lead had shrunk to 8 points when voters were asked which candidate would be more likely to bring change. It's now up to 14 points in the new poll. 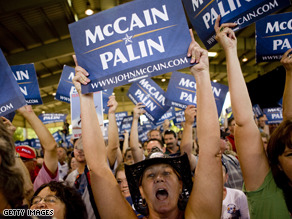 Another factor could be McCain's running mate, Alaska Governor Sarah Palin. Thirty-five percent of those questioned have an unfavorable opinion of her, up 8 points from our previous survey. And two-thirds believe she and her husband should testify in the Alaska investigation into her firing of a state official. "Change has always been Obama's strong suit, but McCain and Palin clearly made inroads into that issue during the GOP convention," said Holland. "Palin, in particular, was seen as an agent of change when she made her first appearance on the national stage. That may be changing now." The poll also sheds more light on how Americans feel about the financial crisis. Twenty-two percent say they are scared about the crisis, with two-thirds concerned. Eleven percent say they are not worried. Most Americans think that the programs to deal with the financial crisis currently being worked on by Congress and the Bush administration will be unfair to U.S. Taxpayers - but they think those programs will ultimately help the economy. In general, six in ten believe that federal government should step in and address the financial crisis; 37 percent say the government should stay out. But when it comes to last week's bailouts, support slips to 55 percent - and given the concerns about how future programs will affect taxpayers, it conceivable that public support for the plans that Congress and the administration are working on could fall even lower. The survey comes out just four days before McCain and Obama face off in the first of three presidential debates. Will the debates make a difference? Probably, since the poll finds that 14 percent of Americans say they haven't made up their minds yet. The CNN/Opinion Research Corporation poll was conducted Friday through Sunday, and included interviews of 1,020 Americans, including 909 registered voters and 697 likely voters. I am from England but now live in the States. I seem uneducated regarding the way we think here in America. If this election was conducted back home in England, Labour would have forfeited to the Conservatives long before hand, just for the sake of saving campaign and election costs. Why are the Republicans still in the race anyway? I don't get it! Now that were talking about real issues not lipstick, Obama Surges ahead .....Go Figure!!! The Enron loop is primarily why we are in the mess we're in now. Now who was behind that??? Oh yeah it was Phil Gramm, McCains economic adviser. But we're in a mental recession and we're just whining over nothing. Are you surprised the Rethugs are getting blamed????? ?